JNN 02 May 2015 Baghdad : A wave of bombings hit Baghdad after nightfall on Thursday, killing at least 21 people and wounding scores of others. One of the car bombs exploded near a number of restaurants and shops in Baghdad’s eastern Shiite district of Talibiyah, killing two people and wounding 10 others. On Friday morning, residents came out to assess the damage, with one saying that people weren’t even safe in their homes anymore. The deadliest of the attacks hit the western Sunni-majority district of Mansour, killing five people and wounding 12 there, security officials said. Another car bomb near an ice cream shop killed four people and wounded 14 in the Shiite neighbourhood of Hurriya in northern Baghdad. Police said two separate car bombs killed a total of seven people and wounded 18 in two Shiite neighbourhoods in eastern Baghdad. 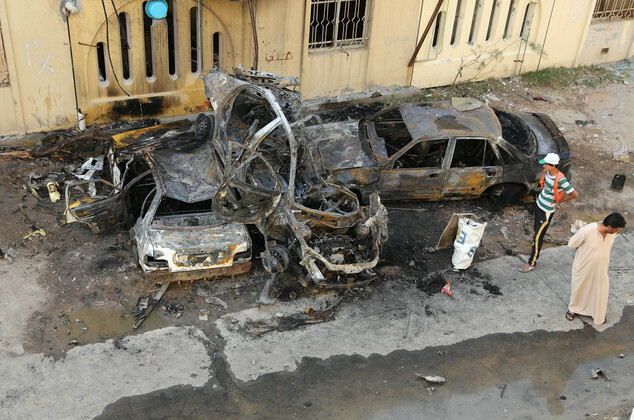 In Madain town just south of Baghdad, a bomb blast near a cafe killed three people and wounded 11, officials said. The wave of bombings came just hours after the head of the European Union’s humanitarian aid department, Jean-Louis de Brouwer, warned that the situation in Iraq was deteriorating rapidly while the world was preoccupied with crises elsewhere. This entry was posted in Iraq News, Middle East and tagged Baghdad, car bombs exploded, Jean-Louis de Brouwer. Bookmark the permalink. IT WAS THE BEST OCCASSION TO CATCH EACH AND EVERY KILLER TERRORIST AND SEND THEM TO JAHANNUM STRAIGHT AWAY RATHER SENDING TO JAIL & TRAIL .